Putting together this X-Speed 250 racing quadcopter from ArrisHobby.com has been a blast. To date all the birds I’ve built or bought have been larger, slower, GPS stabilized craft with the purpose of capturing photos and video. Those types of multirotor copters are designed to fly smooth, easy, and not bank more than a few degrees. Not the case with this drone. It is built for SPEED, agility, and acrobatic flight. I have no skills in that area and learning to fly that way after doing a couple of years of stabilized flight is tough. The learning curve for the Naze32 flight controller is tough too. I’ve been soaking in all the information I can and I’m quite amazed at what sub-$25 item can do. I’ve gotten the bird airborne in the last week or so, and have now started adding some of the extras I’ll want. First off is battery telemetry. On my photo ships I have the nice lady who lives inside my FrSky Taranis transmitter read me off my battery and cell voltages. That way I know when to begin heading home for a landing to preserve the life of the battery. I want the same functionality on my X-Speed 250, the lady reading me voltages and being able to see the voltages on my transmitter. I did a ton of reading and watched several instructional videos on getting the telemetry working. Most pointed out how “simple” it should be to get the battery telemetry from the D4R-II to the Taranis. There are two jumpers, one ground and one signal, for telemetry on the Naze32 board. Those attach to the telemetry port of the D4R-II. Fine. I did that. I made up a nice cable for it too. In the photo above see the green and black wires going from the D4R-II to the Naze32 board. Though I thought my setup was right, I got zero volts. What most of these instructional videos and online instructions failed to clearly mention, at least the ones I found, is that there is another set of wires to install. The 2nd row down from the telemetry pins on the Naze32 are two battery pins, a hot and a ground. A quick glance at those one might think, “this is a battery input to supply power to the board.” That’s what I thought. But my board is getting power from the BEC of one of the ESC’s, so I never hooked it up. That battery port is NOT for getting power to the board though. It is there for the reason of getting battery voltage for the telemetry! Any kind of battery up to 6S can be hooked to those ports. In the photo above you can see a red and black cable in the middle. That cable is going from the battery port on the Naze32 to the underside of the Xt60 battery connector (yellow at bottom). Once that black and red wire was set up total battery voltage is parsed through to the telemetry pins and voila, the lovely Taranis lady reads me off my numbers. I assume she’s lovely but have never actually seen her. 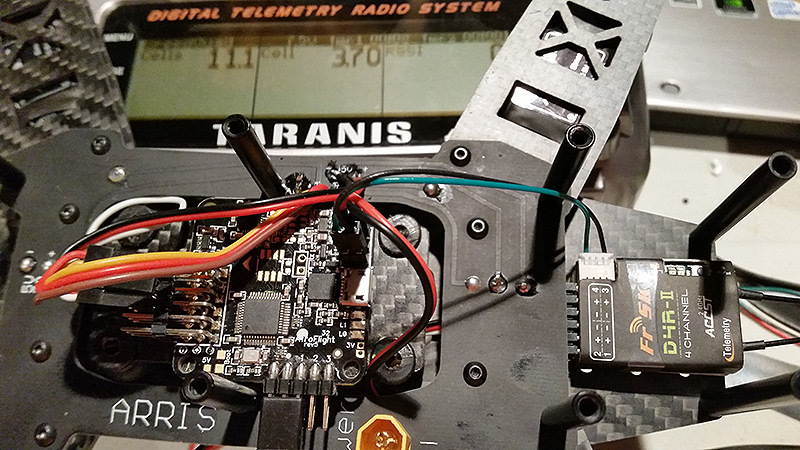 You can also see the voltage numbers in the photo as the Taranis transmitter is at the top. Left is total volts and middle (3.7) is the per-cell voltage. The system is not able to read each cell individually though, it is just dividing the total voltage by three in my case, the number of cells in the battery (3S).